Seattle Seahawks quarterback Russell Wilson and San Francisco 49ers quarterback Colin Kaepernick meet after an NFL football game. The San Francisco 49ers’ free fall continued Sunday, when a 17-3 loss to the Green Bay Packers dropped their record to 1-3 on the season. After an exceedingly tumultuous offseason, the Niners’ slow start has made their Elo rating (our favorite system for estimating an NFL team’s strength) the lowest it’s been since early in the 2011 season. Sunday, Packers linebacker Clay Matthews piled on, mocking Niners quarterback Colin Kaepernick and unfavorably comparing him with Seattle’s Russell Wilson — the two QBs have been a frequent subject of contrast since they became NFL starters in 2012. Matthews must have consulted Pro-Football-Reference.com before kickoff: These days, Kaepernick is no Wilson. 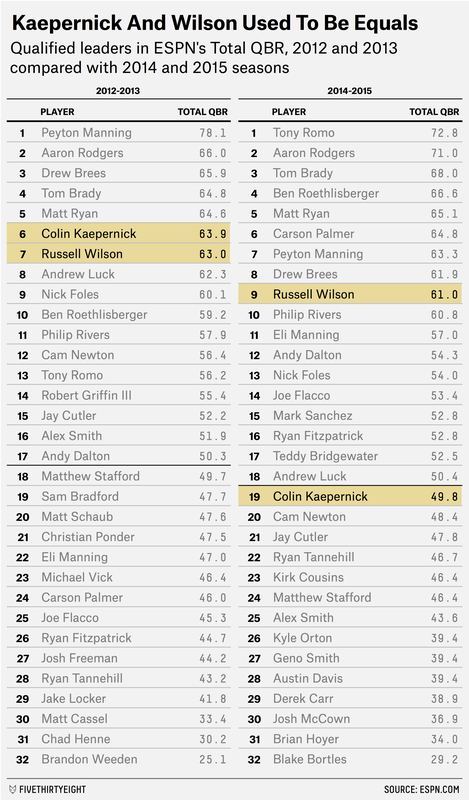 Over this season and last, Wilson ranks ninth among qualified1 quarterbacks in ESPN’s Total QBR metric, while Kaepernick is 19th. The gap that emerged in 2014 has only widened through the first quarter of the 2015 campaign. After his poor performance versus Green Bay, Kaepernick ranks 26th (out of 32 qualifiers) in QBR this season, a startling placement for a QB once predicted to rival Wilson for years. These days, Colin Kaepernick is about three-quarters of the quarterback Russell Wilson is (and, therefore, the QB Kaepernick used to be). Whether undone by San Francisco’s mass exodus of talent, a new-look offense that no longer plays to his strengths or his own stalled development as a passer, Kaepernick’s decline is visible — to the QBR tables, and to opposing linebackers.